April 27, 2017, was a rainy Saturday…but the energy in the room felt like it could have been a beautiful, sunny and 75-degree day. Our team of eight was busy making some renovations to a bedroom. Not just any bedroom, either, but a bedroom for women and children fleeing domestic violence and finding solace at True North. This would be their home, at least for a little while, and we were going to make sure it felt like it. What was more inspiring was that every room up and down that hallway was buzzing with the same energy, as other groups from other churches and community organizations were investing their time, money and energy doing the same thing. 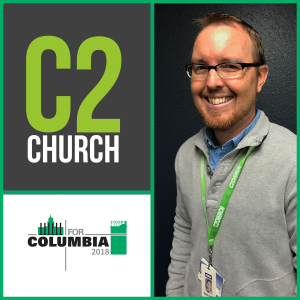 C2 Church has been partnering with ForColumbia for four years now. When we first learned about this partnership, we jumped at the chance to be part of something that was not only bigger than ourselves but fit so perfectly with who we are (and want to be) as a church. As we say in our church, we are “For our city.” Like many churches, we too want to make an impact in our city for its benefit. What better way could there be than to unite under the same banner of serving our community together in the name of the one we all serve: Jesus. Jesus is lifted high, our community is better off, and we, His Church, demonstrate his heart of compassion by being “His hands and feet.” Our participation in ForColumbia helped us develop a greater heart for our city, an expanded awareness of its needs and our ability to meet those needs, side by side with other churches. It’s been wonderful seeing the “ForColumbia” T-shirts around town and feeling a kinship with those wearing them. My wife and I have had many impromptu conversations with other participants who see us wearing our T-shirts and stop to say “I was part of that too!” It must make God smile when His Church lays down the things that identify us as different and unite around the things that make us ONE in Him. This year, I want to encourage every pastor to jump in with us. This is not a promotional venture, nor is it the heart of ForColumbia to get “your people” into someone else’s church or ministry. What I can testify to is that it gave us additional momentum with some serving opportunities we were already doing. It also reinforced the value of serving our community in a unique and uniting way that we could not have done on our own.